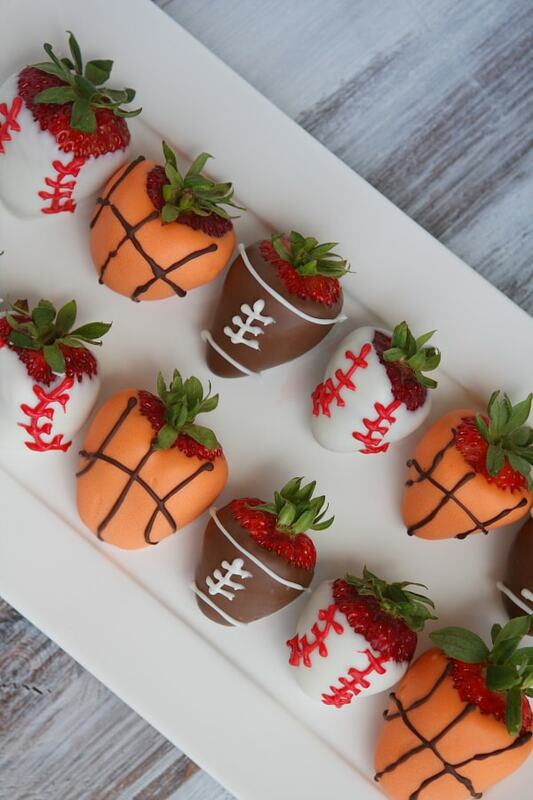 Father’s Day is coming up next weekend, so you may wish to make a little treat for good old Dad… or your Grandfather… or your husband… or your kid’s baseball team. I saw this idea in a teeny tiny advertisement in a magazine recently. 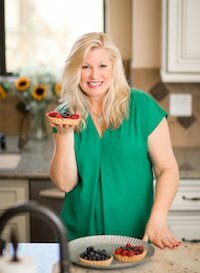 The ad was for one of those goodie, mail ordering companies, and their sport’s dipped strawberries were $24.99 for just 6 dipped strawberries. Yikes. That’s just crazy. I was pretty sure I could replicate these at home for a lot less than that. All you need is a little bit of patience, a steady hand, and just 5 ingredients. Michaels or other craft stores carry these Wilton Candy Melts in various colors. They’re $2.99 per bag, so $12 plus tax. I didn’t mind picking these up because I inevitably use the leftovers for other baking projects too. I haven’t had much luck in the past with melting and coloring regular white chocolate, so these little disks work great. Strawberries are plentiful and ripe right now. Mine were 2 pints for $5. 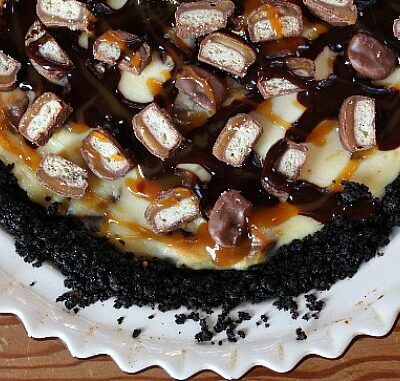 The candy melts work great – no tempering of the chocolate is involved. 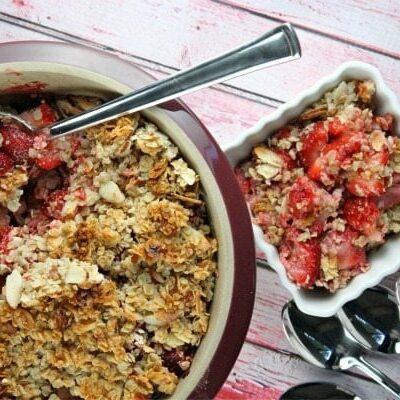 Just place them in a glass dish and microwave for a couple of minutes; stir until smooth, and the strawberries are ready to dip. 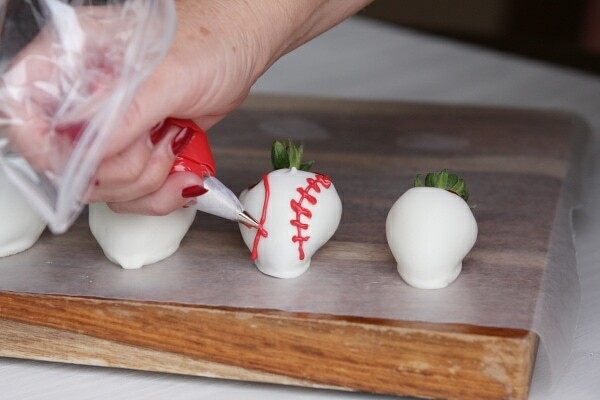 I worked on the baseball strawberries first. For easy piping, I take out a throwaway plastic sandwich baggie and cut a hole in the corner. 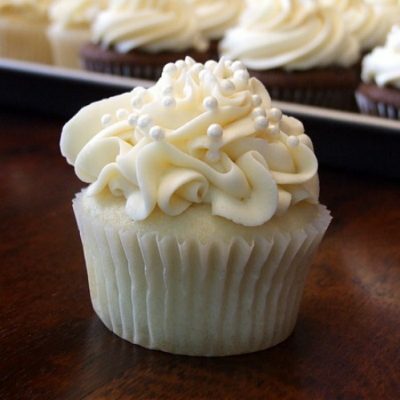 I use a small tip (Wilton #2), pop it into the corner and tape it in place. Then I spoon the melted candy melts into the baggie and it makes for simple, no-fuss piping. With a steady hand, pipe the “laces” onto the baseball. I made basketballs too- orange colored candy melts and then I melted a few dark chocolate chips to use for the lines on the basketball. 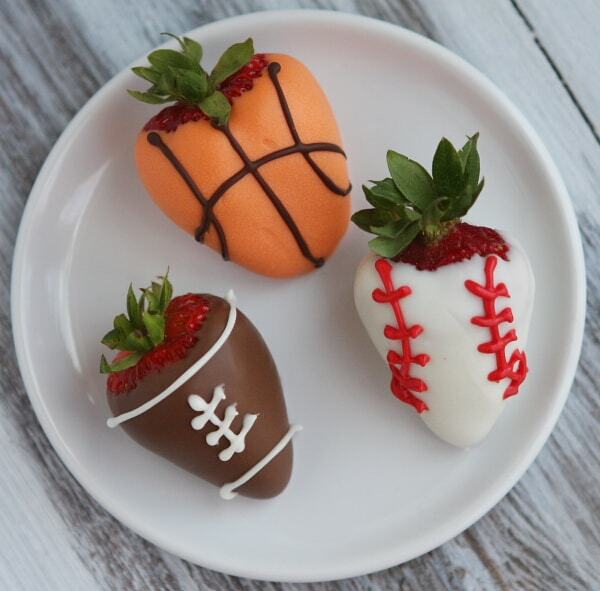 The footballs were made from the cocoa candy melts and white piping. 1. 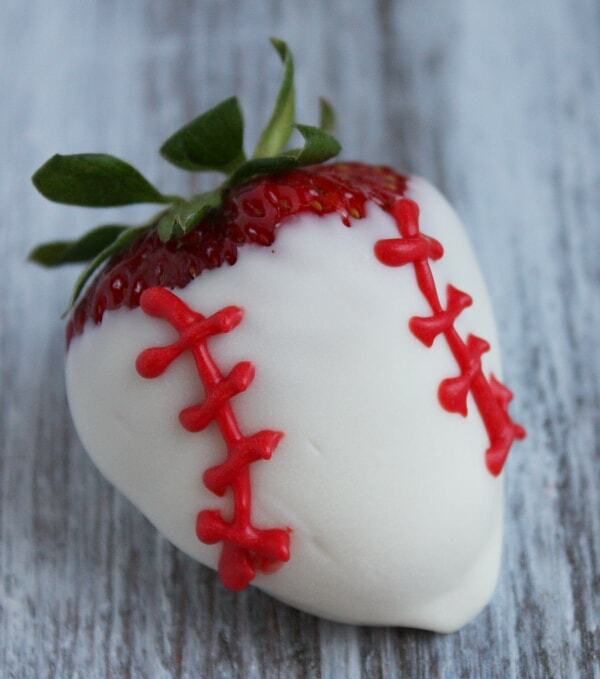 Make baseball-dipped berries: Melt white candy melts in a glass bowl in the microwave (about 2 minutes). Stir until smooth. Dip strawberries in white and set on waxed paper. Once the strawberries are all dipped and set, melt a few of the red candy melts in a glass bowl (microwaved). 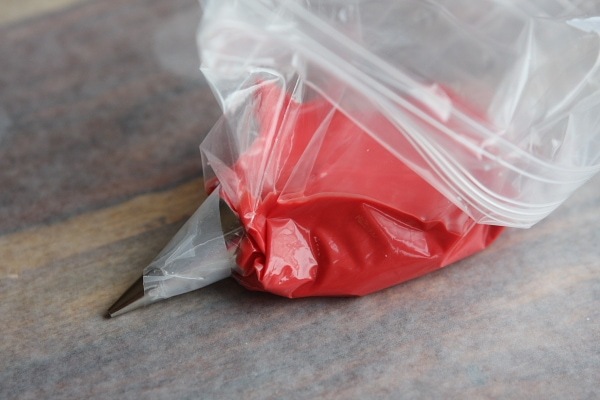 Spoon the melted red into a piping bag (or use a sandwich baggie with the corner snipped off and a small tip inserted into the corner- Wilton #2). Carefully pipe laces onto the white dipped "baseballs." Let them set before moving to a platter. 2. 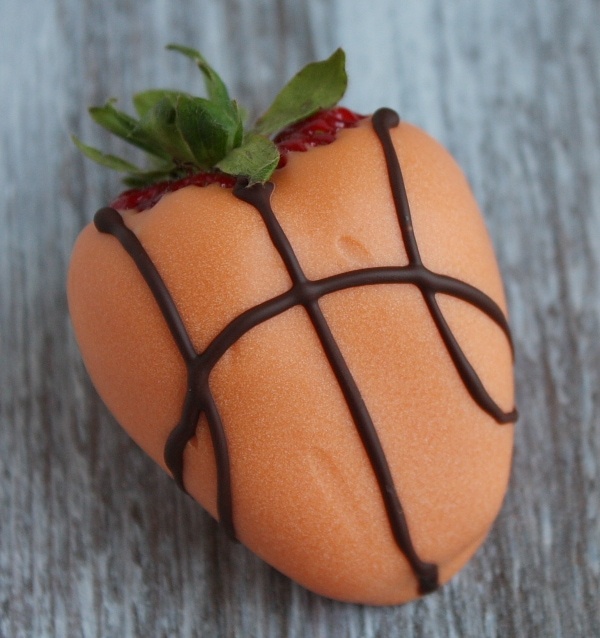 Make basketball-dipped berries: Melt orange candy melts just as you melted the white. Dip strawberries into the orange and set them on waxed paper. 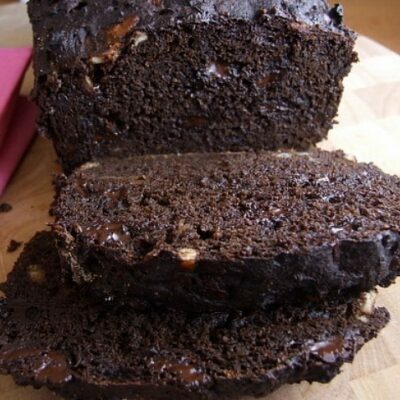 Then melt a few of the cocoa melts and spoon those into a piping bag with a small tip. Carefully draw basketball lines on the orange dipped "basketballs." Let them set before moving to a platter. 3. 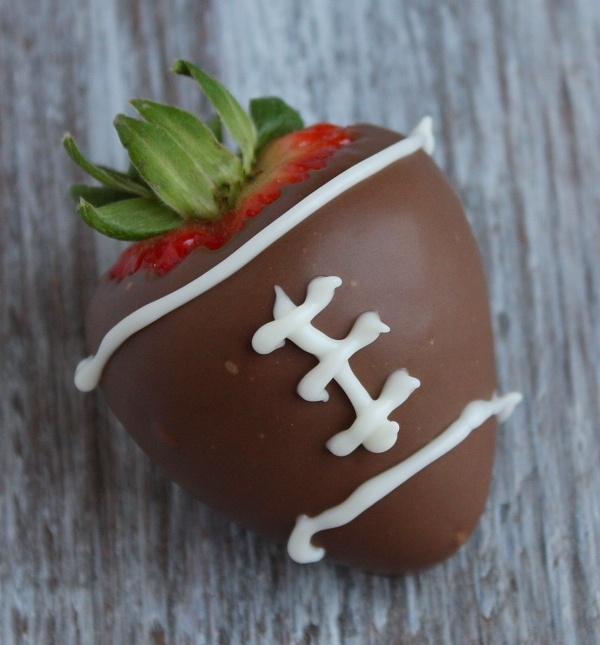 Make football-dipped berries: Melt cocoa candy melts just as you melted the others. 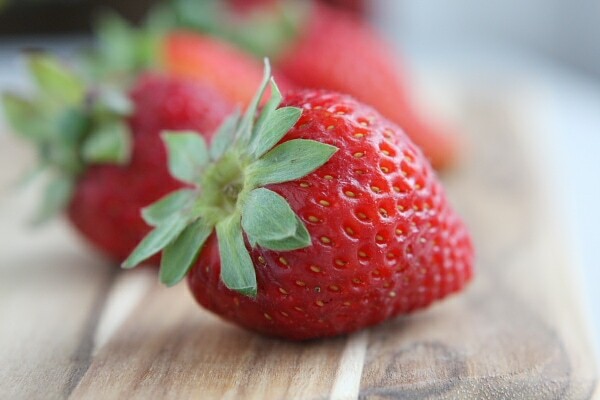 Dip strawberries into the brown and set them on waxed paper. 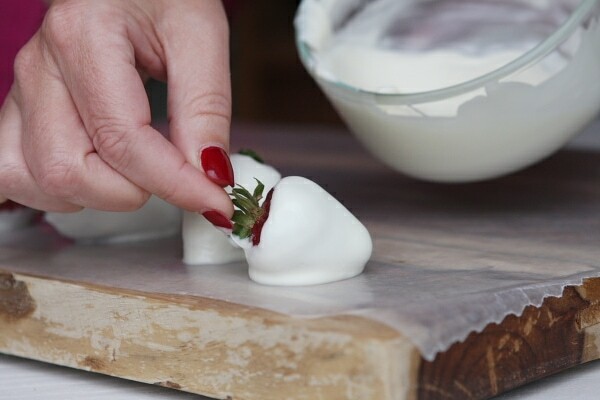 Then melt a few of the white melts and spoon those into a piping bag with a small tip. Carefully draw a line across the bottom and the top of brown-dipped "footballs" and draw the laces down the front. Let them set before moving to a platter. *Wilton candy melts (or other brands) may be found online and at craft and baking stores. They are GLUTEN FREE. *If you'd like a darker line on your dipped basketballs, melt a few dark chocolate chips and use those for piping in place of the melted cocoa disks. 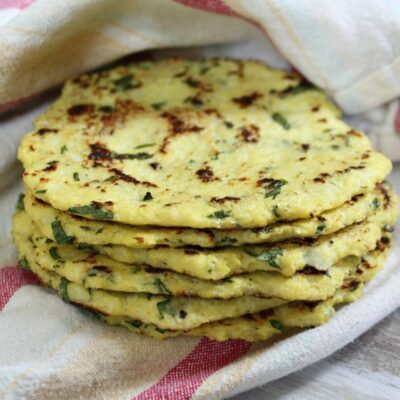 *These can be made early in the day and left at room temperature until ready to serve, or stick them in the refrigerator until ready to serve. 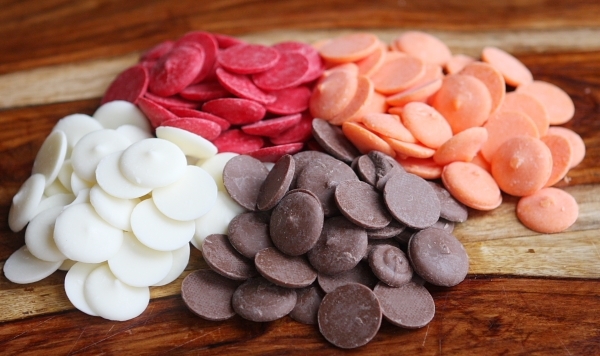 How do they taste using the candy melts instead of chocolate chips? Not as good, of course, but they work out fine and taste decent. 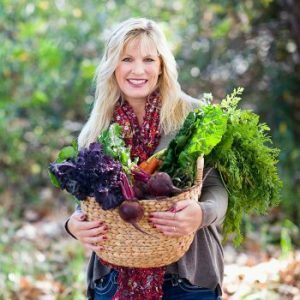 I was literally just on the verge of paying $105 for 2 dozen sport themed strawberries for my son’s 2 year old birthday party (crazy, I know) when I came across this page. Thank you for the instructions!! 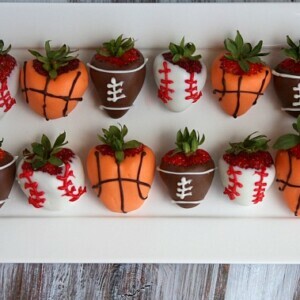 Going to make the baseball ones for my boyfriend for Valentine’s Day! !